I needed to get this on here today. I need to send special birthday blessings to a special man in my life. He first was my Uncle while I was growing up. He held a special place in my heart. He would make me laugh, smile and he had a way to make you feel special whenever you were in his presence. I have now grown and have a family of my own; he is still part of our lives. He has now changed his status from Uncle to Step Dad. My Father as many of you know who follow my blog know that he has passed on. As I said he and my Mom married. They're special to me and my family. My little one as many of you know him by Robbie is very fond of him. He loves it when he comes to our home because that means fun in his eyes. I must say a few times he got to playing with him and I've heard Robbie say " 'nough Pa" What can I say he was my Father's brother so yes, they do some things similar. I was happy that my Step Dad could get that belly laugh back in Robbie. A long time it was silent because his Pa is no longer with us. He misses him of course, but he does love it when Grandpa Steve, to him comes over. Last night we celebrated with Grandpa Steve ~ today is his birthday. His daughter and family came over we hid them because he didn't know they were coming. (mind you I've been planning this since least the end of July beginning of August) We wanted to give him and my Mother the day of his birthday to celebrate together. I made some pulled pork in the crockpot (yummy), Mom brought coleslaw, beans and some fruit, Grandpa Steve's daughter brought three yummy pizza's for the children and adults that wanted it. I made a special card and cake for him. That was something that I wanted to do...hey, what can I say.....he gave me excuse to use my new Cricut Cake Mini. If I hadn't used it then probably would have used the holiday to be my excuse to use it. 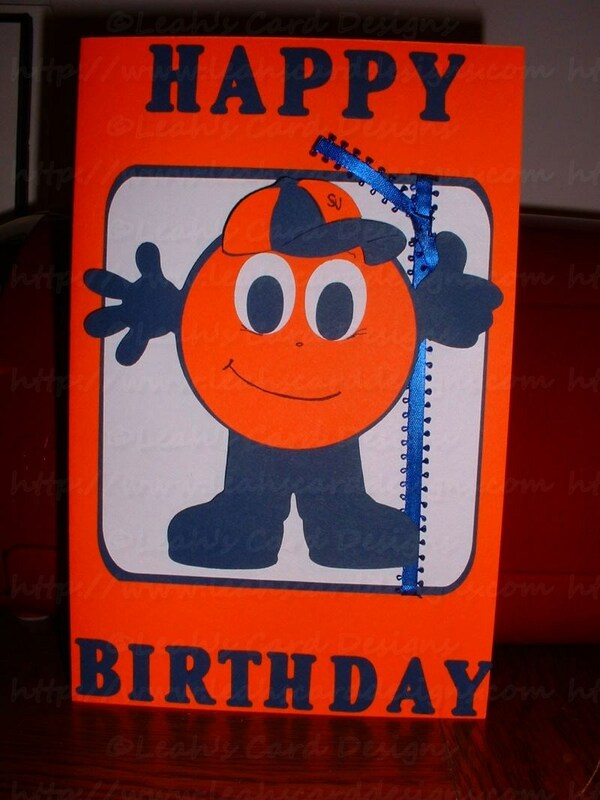 I got into Cricut Craft Room and began designing the mascot for our local team here. 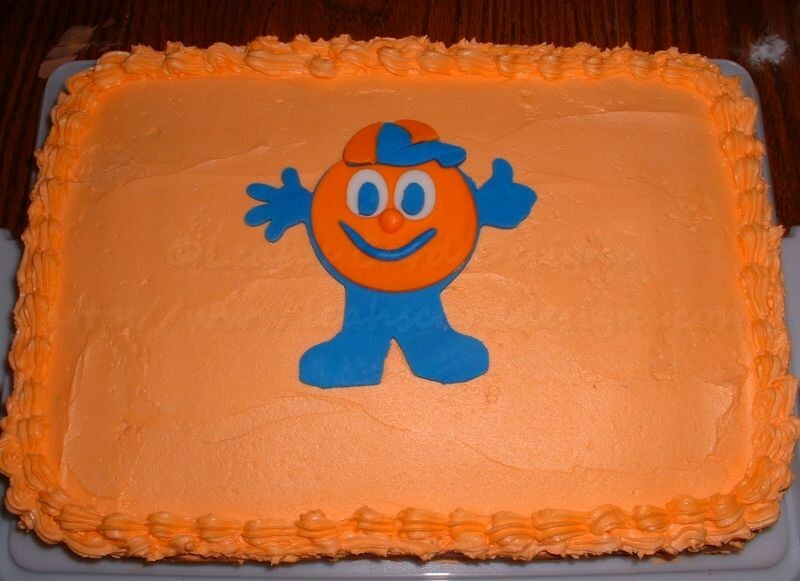 He loves our team here so what better than to put the mascot on his cake. Then to have a card matching as well. Oh, the fun begins...LOL. 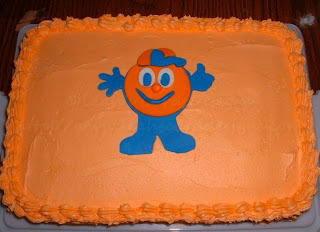 I first started by taking the gum paste and coloring it with the wilton colors orange and blue. When I finally got the shades that I wanted then I rolled it out and placed it on the mat and pressed the cut and was amazed at the results ~ I'll let you take a look for yourself. This is before the candles were placed on it... of course the candles had to match too... orange and blue. This is the card that I made to match. He said he was going to save this one. I figured he would. I'm just glad he had a good night here and was pleasantly surprised with his little party that we put together for him. Have a great day everyone!! Thanks for stopping by to share in the Birthday Blessings for my Step Dad.